We invite you to visit our website of Hotel 500 in Zegrze near Warsaw. Hotel 500 in Strykow is the second in the new chain of Polish 2 stars hotels of upgraded standard. The hotel offers 240 beds - 111 single and double rooms and 5 suites, restaurant and night club. Car park near the hotel is free of charge for our guests. Hotel 500 is an ideal place for organization of trainings and conferences - as it offers 5 professionally equipped conference rooms - where in the biggest one can sit up to 250 people. The possibility of modular division of the biggest conference room allows to hold simultaneously a few panel meetings. 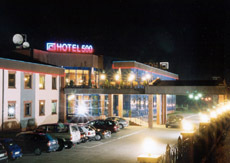 The hotel is located in the Central Poland, close to Lodz (about 12 km ). It is a covenient place for lodging for the tourists visiting Lodz , Lowicz, Leczyce, Tum, Niepokalanow, Zelazowa Wola, Lipce Reymontowskie, Nieborow and Arkadia. The hotel has an attractive location in the region of the Lodz Elevations Landscape Park. We invite our guests to take advantage of various water sports activities near the hotel such as: cannoeing, water skiing, water bicycle riding. The well known horse riding club JANTAR (about 1km away) organizes recreation horse riding. The local countryside fish ponds are very popular among fishermen. The only professional moto cross track in the region is located nearby the hotel. Hotels 500 are proud of professional service, well trained personnel, excellent cuisine and affordable prices. We assure you an excellent climate, unforgettable impressions from your stay here. We cordially invite you. We accept the following credit cards: VISA, MASTERCARD, POLCARD, EUROCARD, and others. The hotel is located about 20 km away from the city centre, 5 km away from the main railway and 30 km away from the bus station. The airport is 40 km away from the hotel. From Lodz Fabryczna or Lodz Kaliska railway station, it's necessary to take a tram or bus and reach Lodz-Doly. From Lodz Doly minibuses of private carriers take passengers to the hotel. It takes 20 minutes time and price is 2 PLN per person.